The client wanted two things. The first was satellite TV and KVH TV1 fit the bill. It's small, easy to install and supports up to eight receivers. The second goody on the list was improved WiFi access. Although the home port has adequate WiFi service they have discovered many marinas do not. Based on Ben Ellison's Panbo assessment of WiFi systems I chose the Rouge Wave Pro. It works better than my most optimistic expectations. I'll talk about this a bit later. Then it became a case of in for a penny, in for a pound. The original flat panel plasma TV was okay, but just that. Measurements are taken, and it's new TV shopping time. The end result was a Samsung 5500 32" Smart TV with WiFi. Smart is an understatement. Built in browser with some clever techniques that let you use the remote for URL and search entries. Easy short cuts to Netflicks, YouTube and the ilk. It's very thin, and looks sharp in its new home. So now we have a big chunk of the pieces in already in place to create a truly connected boat. I've added a Raspberry Pi 2 Model B to act as an interim Signal K server and it's now connected it to the Netgear router. The two yellow boxes will turn blue in time. I have the Arduino and will install it downstream. It will be used to test some Internet Of Things control applications and the system can be used to test prototype gateways when they become available. This is one of two local systems being installed. But this is all for part two. This is what a Signal K system will typically look like on your boat. The boxes may well be different but the concept will not. This will be a beta site and I'm playing with ways to install the gear, make it unobtrusive, easy to access, and I'm documenting any issues along the way. My mantra is it's better to be lucky than smart, although being both lucky and smart isn't a condition to be sneered at. The boat is a Searay 39 MY and in this case the lucky part of the equation is access is great. Below this panel is a large removable cabinet door where a couple of air conditioner units live. I can actually work myself into the void, sit upright and get at the back of the panel. It's also right next door to the new TV which made its installation easier. 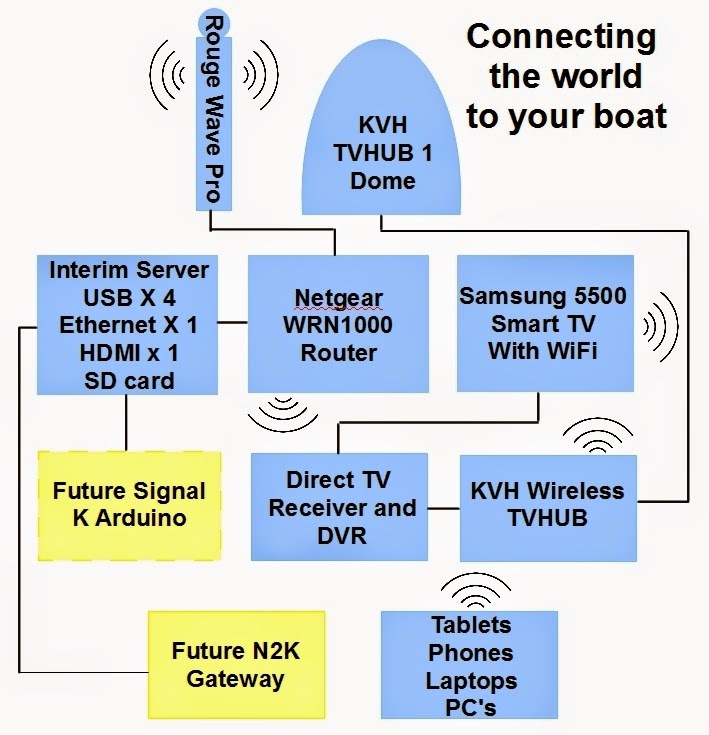 Much has been going on behind the scenes with the Signal K project which has culminated with NMEA's formal recognition of Signal K that appeared on their website yesterday, and the most excellent article about all of this by Ben Ellison on Panbo. 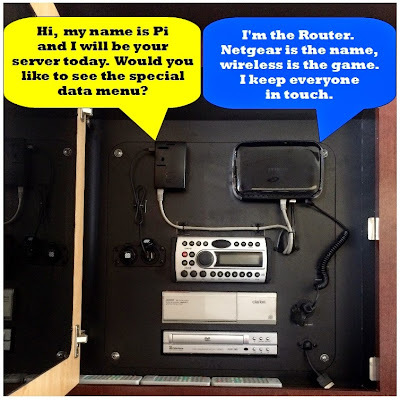 So I thought I would post some FAQ's about the project and provide a glimpse of what a system would look like on a boat. There are three pieces to the system. In this beta installation I'm using a Raspberry Pi-2 as the interim server. It has a Ethernet connection to the Netgear router, four USB ports, a SD card slot and will be powered by a dual USB charging port. 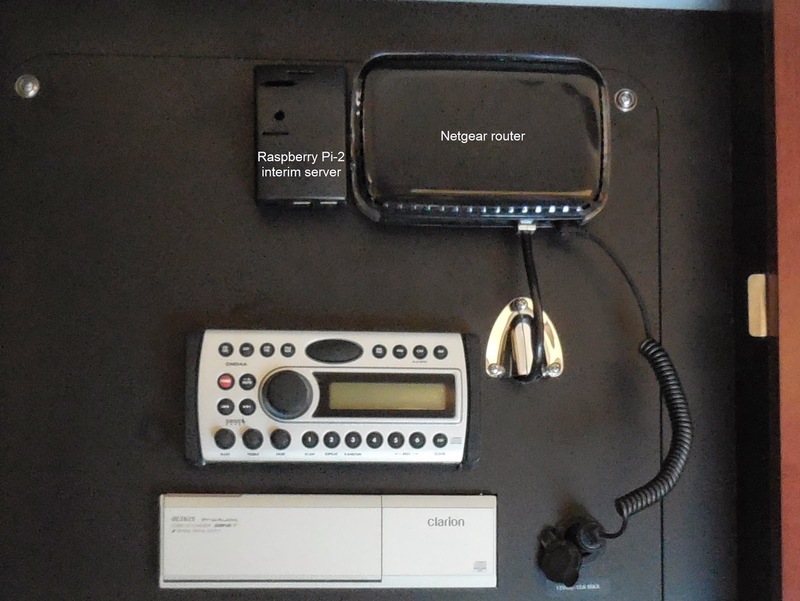 The yet to come NMEA 2000 Signal K gateway will be installed behind the panel. 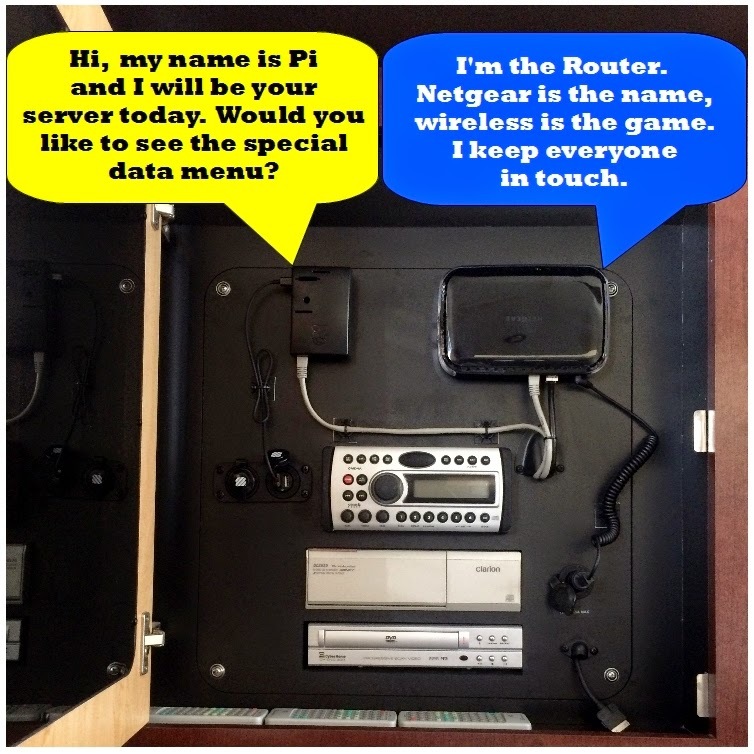 The router power is going to be reconnected behind the panel. The SS clam shell will be painted black so it doesn't stick out like a sore thumb. The point is a Signal K installation doesn't require much space, doesn't have to be ugly, won't cost much and the bonus is you get a wireless access point on your boat. I'm finishing a piece on this install which will pop out shortly.